Dropping down into the high desert, as I have called Central Oregon since I first visited there, is always exciting in the way it transitions from the deep green of the Cascades to the beige and sage of the high and dry country.But Central Oregon is really continuing the transition from the lushness of Western Oregon to the arid frigidness of Southeastern Oregon. As I passed the furthest point I had, as of yet, traveled east of Bend on Higway 20, I tried to soak it all in. But my eyes were unused to the vastness of sagebrush that seemed to undulate like the gray-green ocean without land in sight. Here and there a brown butte would puncture the sea of olive, sea foam and sage greens. An occasional blood-red abraision of rim-rock would sit on the earth like an angry scar. But mostly you looked out as far as you could and couldn’t imagine what was on the other side of it all . I brought a book on tape and ate sunflower seeds to kill the time and the monotony of the desert, but the newness of it all kept my eyes light and my attention rapt. I knew how this land was formed. I understood the massive tectonic forces that created this landscape in the late pliocene and early pleistocene, and the evidence was everywhere. Every adventure has that thrill of the unknown, that aspect of discovery, and this trip had all of that as well as the anticipation of seeing something I had waited a lifetime to see. I feel I can say that now. A lifetime. 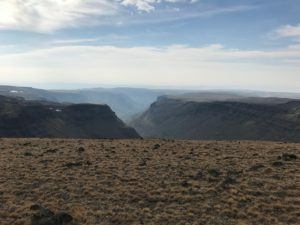 I’m 43, and I’ve wanted to see Steens Mountain since I was a kid, since the first time I heard a hunter talk about that long, sloping east side of the mountain and the way it just drops away for thousands of feet down to that Alvord Desert way below. Burns was going to be a quick stopping point for gas and whatever grociers I’d need on the mountain, but a triple vehicle accident shut Highway 20 down just about twenty miles east of the town. I waited in the hot sun for about two hours, as my state vehicle did not have air conditioning. A few drivers exited their cars and walked toward me hoping I’d have a radio to find out what the delay is. I kept to myself and pretended to busily surf some app on my phone as they hovered around my car. 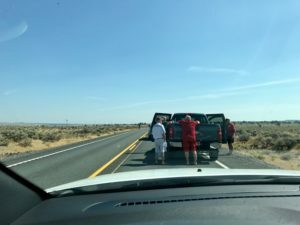 When traffic finally started to move, I debated with myself about continuing up Steens Mountain. Could I get on the mountain and off again before nightfall? The road up there is all gravel, and a flat tire might mean spending the night. I’ve heard the stars look amazing from Steens, so that didn’t seem unappealing. 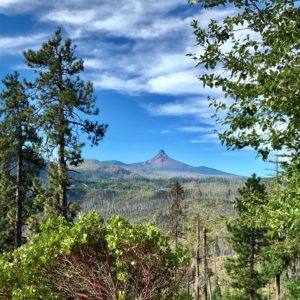 I gassed up and picked up a couple of ice teas for the road and made my way out of Burns toward that big fault block shrouded in forest fire smoke somewhere to the south of me. This landscape is all very different. I’ve traveled the Great Basin many times, but this part of Southeast Oregon is altogether unique with snaking rimrock and massive rockfalls. Brilliant blond dried-up lake beds and big sage. I hit French Glen at 5:00 p.m. and proceeded up the long gravel road to the top of Steens Mountain. Notice how it’s Steens Mountain and not Steen’s Mountains? While you could be forgiven for thinking it’s a range of mountains, it is, in fact, a single mountain. And for all intents and purposes, it should’ve probably been Steen’s Mountain, since it was named for Major Enoch Steen. But no mapmakers included that version on the early maps of the region, so Steens Mountain stuck. You have a lot of time to kill as you drive up that long gravel road from French Glen to the Kiger overlook. I spent it trying to envision what it would look like. I should’ve wondered what it would feel like. I drove past Kiger overlook to hit East Rim overlook for reasons I can’t really define. I stepped out of the car near the Little Blitzen Gorge, right above a small snowfield where the Donner und Blitzen River forms, and felt a wave of vertigo wash over me as I looked over the edge into an abyss of swirling browns and smoke-tinged blue skies. If I walk a bit, that feeling will go away, I thought to myself as I forgot to breathe the already thin air. 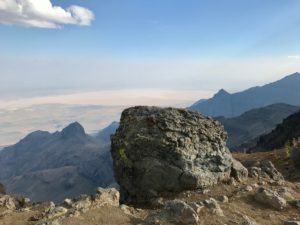 I was shortly out of breath and stopping to try and catch it between the exhilirating feeling of vertigo and the altitude adjustment my lungs were trying hard to make at more than 9,000 feet. Let’s try this again, I thought, as I got back in the car and drove up to East Rim overlook. Steens Mountain, Tim Akimoff. Tim Akimoff, Steens Mountain. This time I took my time walking up to the overlook, allowing my body to adjust to the altitude and fully expecting the view to take my breath away again. I was so not dissapointed as I started to see the pieces of this puzzle I’d had in my brain since I was probably twelve or thirteen years old fit together. There was Mann Lake far below, just a tiny drop, a puddle really, of a remnant of an old glacial lake. 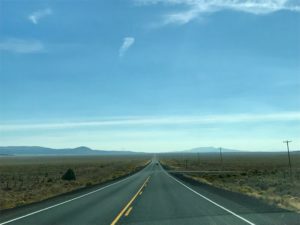 And there was the playa, the sandy blond stretch of super-dry desert eight miles wide and seventy miles long that lives in the rain shadow of Steens Mountain cracked and parched. Here I was finally seeing it and sorting through the feelings of many years in the reality of it all. I wondered around for a bit, live-streamed the view for family and friends, took some pictures and then just put my phones and camera away and just sort of tried to take it all in the way you might try with a panorama. For a few minutes I watched a few couples reacting to the view the way I did the first time. That, I figured, was a universal feeling. Then wandered over to Kiger Gorge, which actually suprised me beyond the surprise of seeing a place that beats all the expectations. 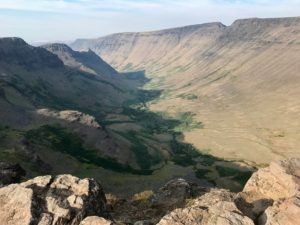 Carved out like a giant, earthen punchbowl with serrated edges at the top and a lush-green, fading to light brown interior, it was exactly like views I’d last seen in Glacier National Park, a jewel, as they call it, in the crown of the continent. The wind whipped up the old ice house, curled around the bowl below me and formed a choir that sang something unintenlligable and yet beautiful just beyond that place where you can understand music. I listened as it grew stronger and the sun’s rays stretched out the way they do when you know the day has grown tired and begins to stretch itself thin. And I felt the pressure change from neutral to go soon. So I turned my head in a panorama the way I would do with my iPhone to try and preserve that view to be able to pull it up later, sound included. The windy voices sing me back to the car, and I reluctantly close the door and turn it on, which silences them. And my ears are, for once, assaulted by the All Pearl Jam station on XM Radio. The voices fade from my ears and from memories as the more familiar “Jeremy” fills the space, and my mind travels back to future filled with worry and angst. For a few minutes up on that mountain, I was in the here and now.